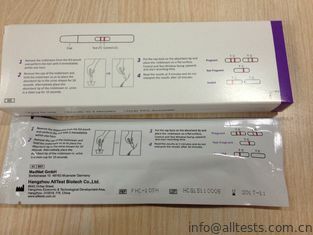 The hCG Pregnancy Rapid Test Dipstick is a rapid chromatographic immunoassay for the qualitative detection of human chorionic gonadotropin in urine to aid in the early detection of pregnancy. Human chorionic gonadotropin (hCG) is a glycoprotein hormone produced by the developing placenta shortly after fertilization. In normal pregnancy, hCG can be detected in both urine and serum or plasma as early as 7 to 10 days after conception.1,2,3,4hCG levels continue to rise very rapidly, frequently exceeding 100mIU/ml by the first missed menstrual period,2,3,4 and peaking in the 100,000-200,000mIU/ml range about 10-12 weeks into pregnancy. The appearance of hCG in both the urine and serum or plasma soon after conception, and its subsequent rapid rise in concentration during early gestational growth, make it an excellent marker for the early detection of pregnancy. 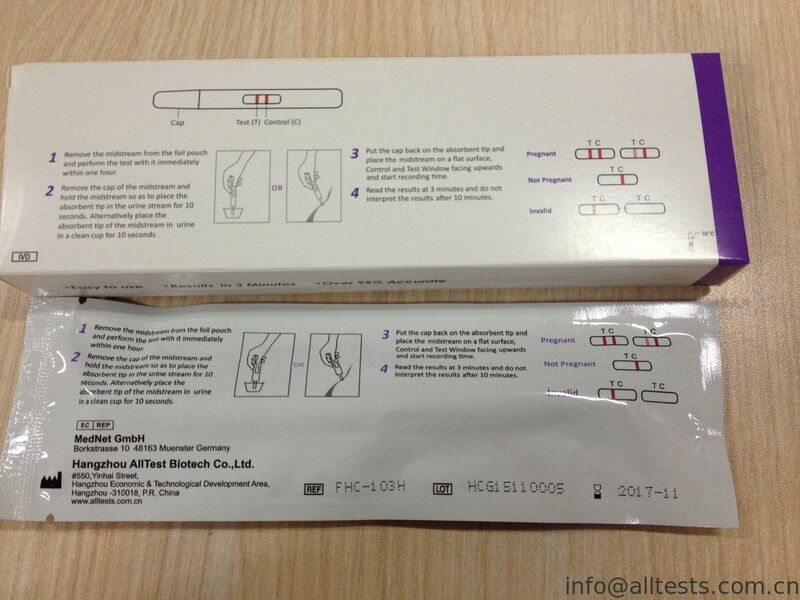 hCG Pregnancy Rapid Test Dipstick is a rapid test that qualitatively detects the presence of hCG in urine specimen at the sensitivity of 25mIU/ml. The test utilizes a combination of monoclonal and polyclonal antibodies to selectively detect elevated levels of hCG in urine. 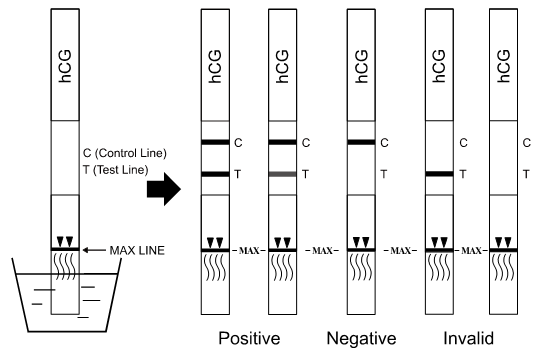 At the level of claimed sensitivity, hCG Pregnancy Rapid Test Dipstick shows no cross-reactivity interference from the structurally related glycoprotein hormones hFSH, hLH and hTSH at high physiological levels. Bring the pouch or canister to room temperature before opening it. Remove the test dipstick from the sealed pouch or closed canister and use it within one hour.For canister packaging, immediately close the canister tightly after removing the required number of the test dipstick(s). Record the initial opening date on the canister. Once the canister has been opened, the remaining test dipstick(s) are stable for 90 days only. With arrows pointing toward the urine specimen, immerse the test dipstick vertically in the urine specimen for at least 15 seconds. Do not pass the maximum line (MAX) on the test dipstick when immersing the dipstick. See illustration below. Place the test dipstick on a non-absorbent flat surface, start the timer and wait for the colored line(s) to appear. The result should be read at 3 minutes. NOTE: A low hCG concentration might result in a weak line appearing in the test line region (T) after an extended period of time. Do not interpret the result after 10 minutes. POSITIVE Two distinct colored lines appear. One line should be in the control line region (C) and another line should be in the test line region (T). One line may be lighter than the other; they do not have to match. This means that you are probably pregnant. NEGATIVE One colored line appears in the control line region (C). No line appears in the test line region (T). This means that you are probably not pregnant. INVALID The result is invalid if no colored line appears in the control line region (C), even if a line appears in the test line region (T). You should repeat the test with a new test dipstick. A procedural control is included in the test. A colored line appearing in the control line region (C) is considered an internal procedural control. It confirms sufficient specimen volume and correct procedural technique. A clear background is an internal negative procedural control. If a background color appears in the result window and interferes with the ability to read the test result, the result may be invalid. It is recommended that a positive hCG control (containing 25-250 mIU/ml hCG) and a negative hCG control (containing "0"mIU/ml hCG) be evaluated to verify proper test performance when a new shipment of tests is received.